Education Minister Lee Jun-shik on Sunday ruled out the possibility of the government withdrawing its much-disputed plan to introduce state-authored history textbooks at schools nationwide. “As of now, I see no chance of it being scrapped,” said Lee who doubles as deputy prime minister for social affairs. Lee reiterated that the ministry is intent on gathering opinions from experts and the public to come up with a more ideal way to introduce the textbooks, not to abolish them. He was seeking to clarify his remarks made Friday during a parliamentary hearing, which had given rise to speculations that the ministry may scrap the textbook plan, depending on public and academic reactions to a preliminary version of the governmental compilations to be unveiled Monday. 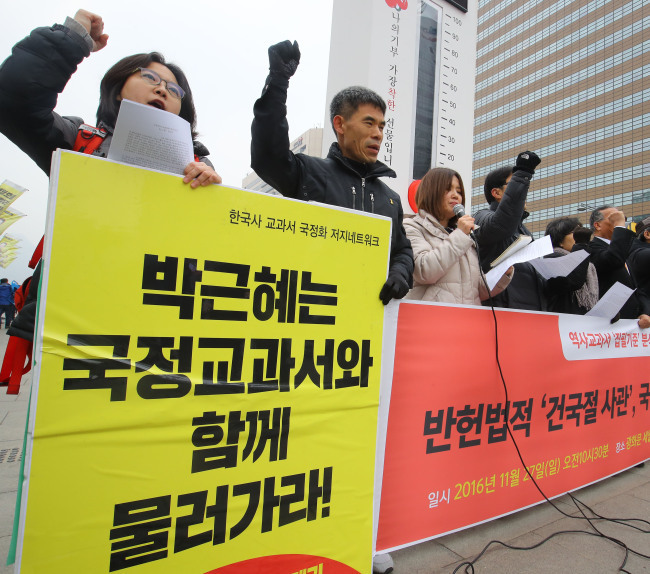 Opponents of the plan have been putting pressure on the government to annul the unified textbook plan, which is a project of President Park Geun-hye, riding on the overwhelming public disapproval of the conservative leader amid a major political scandal involving her confidante. They claim that the plan to replace history textbooks at schools with ones that are authored by government-chosen scholars is an attempt by Park to glorify former dictators, including her own father. Park’s father -- President Park Chung-hee -- seized power through a military coup and ruled the country for 18 years with an iron fist until his assassination in 1979. Currently, South Korean middle and high schools use history textbooks that are published by eight private publishing companies and approved by the government. Primary schools already use a single set of state-authored history textbooks. The Presidential Office wants the new ones to be taught at classrooms nationwide from the coming academic year that starts in March. On Friday, the ministry had revealed its guidelines for the textbooks, which touch on some of the most sensitive disputes in the country’s modern history.